Ole Gunnar Solskjaer faces his biggest test since becoming Manchester United caretaker manager as Paris Saint Germain come to Old Trafford for the first leg of their Champions League last 16 tie. Both teams are in fine form going into the game: Man United have won ten from 11 games, while PSG have 11 wins from 12 – although did recently lose away to Lyon, with Solskjaer and Mike Phelan watching from the stands. United’s only absentees are Antonio Valencia, Matteo Darmian and Marcos Rojo. The French champions, on the other hand, are missing Neymar, Edison Cavani and Thomas Meunier. 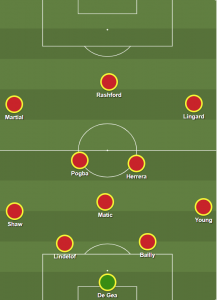 With that all in mind, here is how we predict Man United will line up for their most high-profile game of the season. Ashley Young, Jesse Lingard and Marcus Rashford – the hardworking English contingent of Solskjaer’s revolution – were all rested on Saturday and will be expected to apply relentless energy for 90 minutes. The game may well come down to a battle between the latter and PSG’s own homegrown superstar striker – Kylian Mbappe, who is really, really good. The midfield trio of Paul Pogba, Ander Herrera and Nemanja Matic has looked stronger with each game and will need to reach new heights against Thomas Tuchel’s side. And Neymar must be thankful to miss this game, because Eric Bailly will start, and he would have killed Neymar.